Standard Test Sieves help in ascertaining possible frost action, determining graded, filters, selection of grating materials, designing of Cement and Asphaltic, Concrete mixes etc. 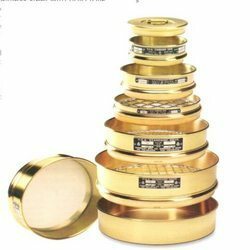 Test Sieves 20 cm dia are fabricated out of spun brass, without joint frame, double folded bottom, having beading at top, tightly fitting with each other (Endcott Pattern), with brass wire mesh. Three series are normally available: BSS/ASTM/BIS. INNOVATIVE INSTRUMENTS a reputed manufacturer of all types of Testing Sieves, from sampling, classification of soils, aggregates and other powdered and granular materials to specific ASTM, BS & IS standard tests. We carry an extensive inventory of sieves in all popular sizes and mesh/frame material configurations. We try to maintain a complete stock of 8" and 12" sieves in both full and half heights for quick turnaround, as well as keeping a large inventory of other sieve sizes and frame and mesh configurations. All sieves include a permanently attached metal plate that includes the sieve number, micron size and the nominal opening in millimeters and inches.